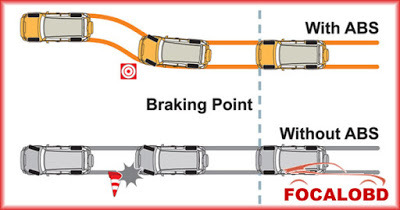 Anti-lock Braking System also known as anti-skid braking system (ABS) is an automobile safety system which prevents the locking of wheels during braking and avoid uncontrolled skidding. The modern abs system allows steering during braking which gives more control over the vehicle in case of sudden braking. The main advantages of using ABS system in vehicle is that it provides better control over the vehicle and decreases stopping distance on dry and slippery surfaces. Since in ABS installed vehicle the chance of skidding is very less and hence it provides a better steering control during braking. Without ABS system, even a professional driver can fail to prevent the skidding of the vehicle on dry and slippery surfaces during sudden braking. But with ABS system, a normal person can easily prevent the skidding of the vehicle and get better steering control during braking. It works on the principle of threshold braking and cadence braking. Cadence braking and threshold braking is a technique in which a driver applies the brakes and releases it before locking up the wheel and then applies the brakes and releases it again before locking. This process of applying and releasing the brakes on the wheel is done in pulse form to prevent it from locking and stop skidding of the vehicle. The driver practices this technique to achieve better control over the vehicle during instant braking and stop skidding of the vehicle. The ABS system automatically does this cadence braking to prevent locking of wheel and skidding of vehicle when brakes are applied. 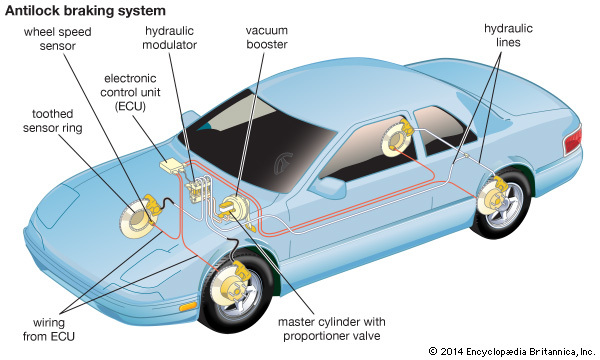 Why Anti-lock Braking System (ABS) is essential in vehicles? To understand this in a better way lets us take an incident. When you are driving your car on a highway and suddenly an obstacle comes in front of you and you apply brake with full power. This will locks wheels of your car and your car will start skidding on the road and also during skidding you lost your steering control and unable to move the car in desired direction in which you want. Finally you hit that obstacle and meet an accident. Let’s us take another situation, now you are driving a car which is equipped with anti-lock braking system. When you encounter with an obstacle on the road and suddenly apply the brakes. But this time the ABS system of your car prevent the locking of the wheel and avoid skidding. At this time you can control your steering and can stops your car hitting from the obstacle. This is how the abs system prevents the skidding of the vehicle and provides greater control over it and prevents accidents. It is used to calculate the acceleration and deceleration of the wheel. It consists of a toothed wheel and an electromagnetic coil or a magnet and a Hall Effect sensor to generate signal. When the wheel or differentials of the vehicle rotates, it induces magnetic field around the sensor. The fluctuation in this magnetic field generates voltage in the sensor. This voltage generated sends signals to the controller. With the help of the voltage the controller reads the acceleration and deceleration of the wheel. Each brake line which is controlled by the ABS has a valve. 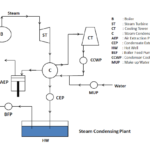 In some of the systems, the valve works on three positions. In position one, the valve remains open; and pressure from the master cylinder passed through it to the brake. In position two, the valve blocks the line and separates the brake from the master cylinder. And this prevents the further rise of the pressure to the brakes. Valve operates in second position when the driver applies the brake harder. In position three, some of the pressure from the brake is released by the valve. The clogging of the valve is the major problem in ABS. When the valve is clogged, it becomes difficult for the valve to open, close or change position. When the valve is in inoperable condition, it prevents the system form modulating the valves and controlling pressure to the brakes. 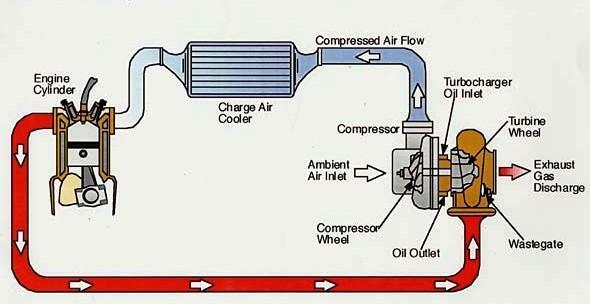 Pump is used to restore the pressure to the hydraulic brakes after the valve releases the pressure. When the controller detects wheel slip, it sends signals to release the valve. After the valve releases the pressure supplied from the driver, it restore a desired amount of pressure to the braking system. The controller modulates (adjust) the status of the pump so as to provide desired amount of pressure and reduce slipping of the wheel. The controller used in the ABS system is of ECU type. Its main function is to receives information from each individual wheel speed sensors and if a wheel loses its traction with the ground, a signal is sent to the controller, the controller than limit the brake force (EBD) and activate the ABS modulator. The activated ABS modulator actuates the braking valves on and off and varies the pressure to the brakes. The controller (ECU-Electronic Control Unit) reads the signal from each of the speed sensors of the wheel. As the brakes are suddenly applied by the driver, this makes the wheel to decelerate at faster rate and may cause the wheel to Lock. As the ECU reads the signal which indicates the rapid decrease in the speed of the wheel, it sends signal to the valve which makes the valve close and the pressure to the brake pad reduces and prevents the wheel from locking. The wheel again starts to accelerate, again the signal sends to the controller, this time it opens the valve, increasing the pressure to the brake pad and brakes are applied, this again reduces the speed of the wheel and tries to make it stop. This process of applying brakes and releasing it happens 15 times in a second when a driver suddenly applies the brake harder. Due to this the locking of the wheel is prevented and the skidding of the vehicle eliminated. During braking with ABS system, the driver can steer the vehicle and reduces the risk of vehicle collision. How Would you Know that the ABS System is in Operation? When the ABS in operation, it can be felt by the driver through pulsation in the brake pedal; this happens because of the rapid opening and closing of the valves. The pulsing action of the pedal tells the driver that ABS system is in operation. Any fault in the ABS system is indicated on the instrument panel of the vehicle and it will work when the fault is completely removed. 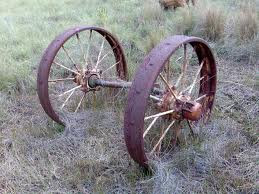 It prevents the locking of the wheel and thus eliminates the chance of skidding. The skidding of the vehicle is completely removed, which results in excellent control during braking? A better steering control is obtained with the ABS system. It reduces the chance of collision by 30 %. A vehicle equipped with ABS (Anti-lock Braking System) is costlier as compared with a vehicle without ABS. ← What is Surface Tension?